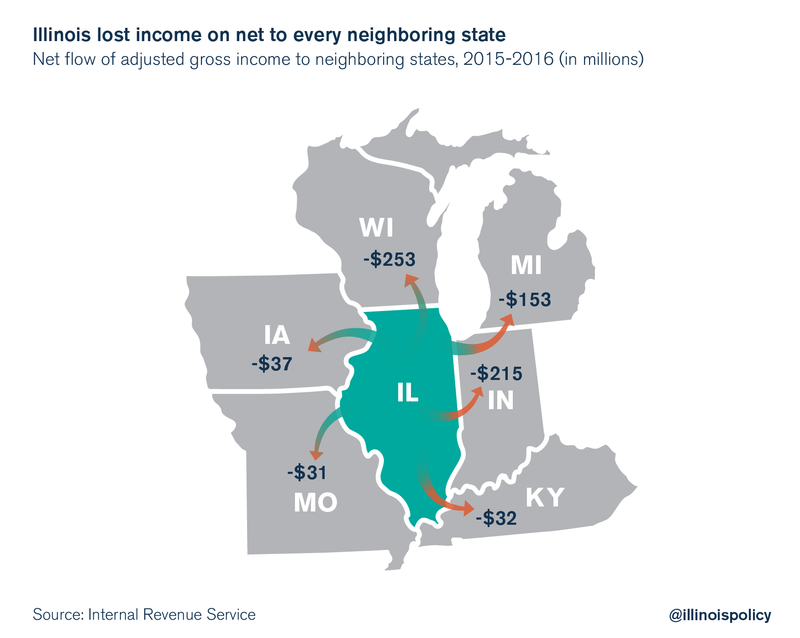 New data from the IRS show Illinois lost $720 million and 21,800 people on net to neighboring states from 2015-2016. Illinois lost the border wars with every neighboring state in tax year 2015 (2015-2016), according to new data from the IRS. On net, more people and money “walked out” of Illinois to neighboring states than walked in. Illinois lost 21,800 residents to neighboring states on net, measured in exemptions. Indiana was the biggest winner out of Illinois’ bordering states, gaining more than 8,200 exemptions on net. 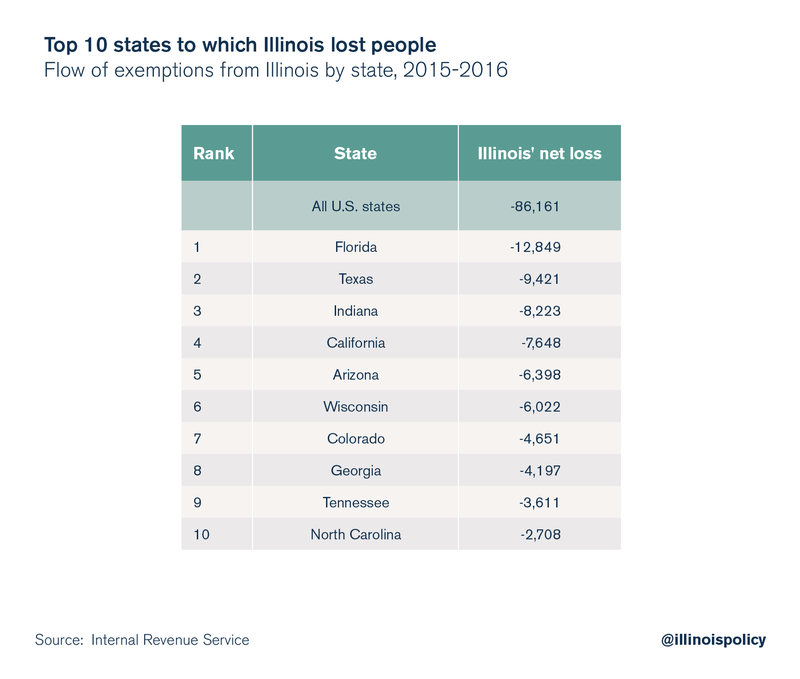 Nationally, both Indiana and Wisconsin both landed in the top 10 as net gainers of Illinois exemptions. Indiana saw the third-highest net gain of Illinois exemptions while Wisconsin’s net gain was the nation’s sixth-highest. When those residents leave Illinois, they take their wallets with them. The Land of Lincoln lost more than $720 million in adjusted gross income, or AGI, on net to neighboring states in 2015-2016. Wisconsin saw the largest gain. Illinois lost $253 million in AGI to the Badger State, on net. Both Wisconsin and Indiana landed in the top 10 as net gainers of Illinois income, taking the No. 6 and No. 7 spots, respectively. Since the 2011 temporary income tax hikes, the flight of wealth and people from Illinois has accelerated. 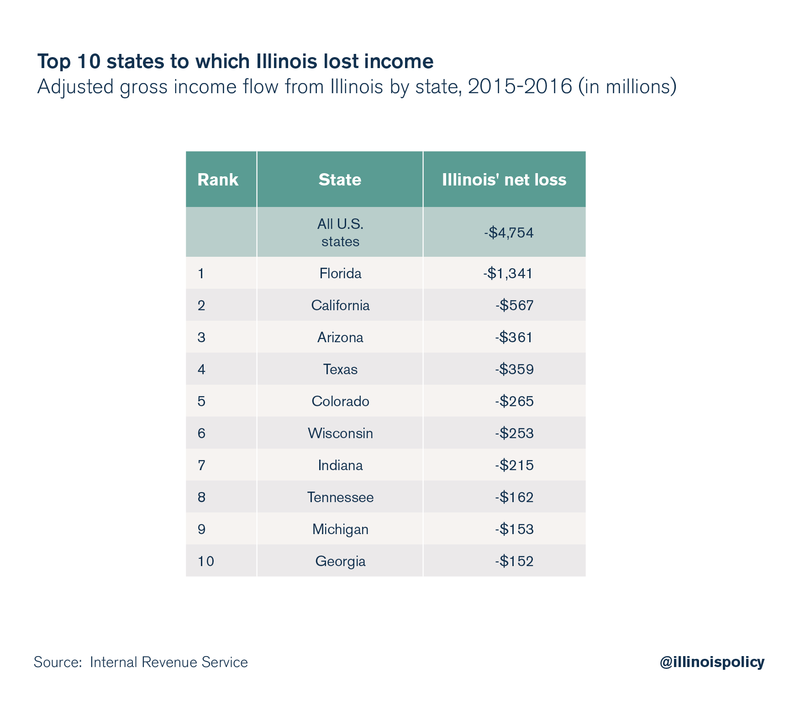 The 2015 tax year saw Illinois shoulder record losses of income and people. This consistent, worsening trend is an indictment of the policy status quo in Illinois. A 2016 Paul Simon Public Policy Institute poll found Illinoisans cited taxes as the No. 1 reason for wanting to leave the state. And while Illinois’ temporary income tax hike partially sunset at the start of 2015, left to run wild was the largest tax Illinoisans pay: property taxes. Illinoisans shoulder the heaviest property tax burden in the nation, according to a 2016 study from real estate-services company CoreLogic. Yet for years, Springfield has rejected any substantial reforms to address the cost-drivers behind those property tax bills: the highest number of local governments in the nation, skyrocketing local pension costs and unfair collective bargaining rules that stack the deck against taxpayers in negotiations, to name a few. Proposals for a hard property tax cap have been snubbed as well. In the face of this out-migration problem, Illinois lawmakers passed the largest permanent income tax hike in state history in July. Of course, taxes aren’t the only reason people are leaving. The state’s laggard economy, demonstrated by legions of Illinoisans dropping out of the workforce altogether, is another likely culprit. Illinois’ exodus of people and money is the state’s most pressing policy problem. Until lawmakers get serious about addressing its causes, there’s little reason to think the trend will change.